GENEVA (AP) — After days of intense negotiations, the United States and Russia reached agreement Saturday on a framework to secure and destroy Syria's chemical weapons by mid-2014 and impose U.N. penalties if the Assad government fails to comply. 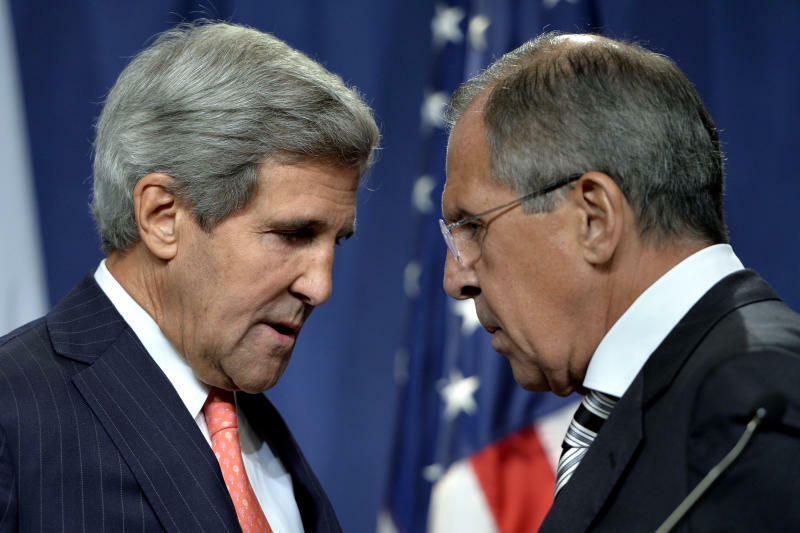 The deal, announced by U.S. Secretary of State John Kerry and Russian Foreign Minister Sergey Lavrov in Geneva, includes what Kerry called "a shared assessment" of the weapons stockpile, and a timetable and measures for Syrian President Bashar Assad to follow so that the full inventory can be identified and seized. President Barack Obama made clear that "if diplomacy fails, the United States remains prepared to act." "The world will now expect the Assad regime to live up to its public commitments," Kerry told a packed news conference at the hotel where negotiations were conducted since Thursday night. "There can be no games, no room for avoidance or anything less than full compliance by the Assad regime." Lavrov added, cautiously, "We understand that the decisions we have reached today are only the beginning of the road." "Ensuring that a dictator's wanton use of chemical weapons never again comes to pass, we believe is worth pursuing and achieving," Kerry said. The group's director-general, Ahmet Uzumcu, spoke of adopting "necessary measures" to put in place "an accelerated program to verify the complete destruction" of Syria's chemical weapons, production facilities and "other relevant capabilities." "There is an agreement between Russia and the United States that non-compliance is going to be held accountable within the Security Council under Chapter 7," Kerry said. "What remedy is chosen is subject to the debate within the council, which is always true. But there's a commitment to impose measures." "Any violations of procedures ... would be looked at by the Security Council and if they are approved, the Security Council would take the required measures, concrete measures," Lavrov said. "Nothing is said about the use of force or about any automatic sanctions." Kerry spoke of a commitment, in the event of Syrian noncompliance, to "impose measures commensurate with whatever is needed in terms of the accountability." "I have no doubt that the combination of the threat of force and the willingness to pursue diplomacy helped to bring us to this moment," Kerry said. But a leading U.S. senator expressed concerns that without the threat of force, it's not clear "how Syrian compliance will be possible under the terms of any agreement." Republican lawmaker Bob Corker of Tennessee said Syria's "willingness to follow through is very much an open question" and he did not want the negotiations to signal a "retreat from our broader national interests," including support for "moderate" opposition forces in Syria. Under the deal, the U.S. and Russia are giving Syria just one week, until Sept. 21, to submit "a comprehensive listing, including names, types and quantities of its chemical weapons agents, types of munitions, and location and form of storage, production, and research and development facilities." International inspectors, the U.S. and Russia agreed, should be on the ground in Syria by November and complete their initial work by the end of the month. They must be given "immediate and unfettered" access to inspect all sites. Kerry said the two sides had come to agreement on the exact size of Syria's weapons stockpile, a sticking point. U.S. intelligence believes Syria has about 45 sites associated with chemicals weapons, half of which have "exploitable quantities" of material that could be used in munitions. The Russian estimate is considerably lower; the officials would not say by how much. U.N. inspectors are preparing to submit their own report this weekend. Secretary-General Ban Ki-moon said Friday that he expected "an overwhelming report" that chemical weapons were indeed used on the outskirts of Damascus on Aug. 21. A U.N. statement said Ban hoped the agreement will prevent further use of such weapons and "help pave the path for a political solution to stop the appalling suffering inflicted on the Syrian people." Britain's foreign secretary, William Hague, said Saturday's development was "a significant step forward." Germany said that "if deeds now follow the words, the chances of a political solution will rise significantly," Foreign Minister Guido Westerwelle said. Obama called for a limited military strike against Assad's forces in response, then deferred seeking congressional approval to consider the Russian proposal. The commander of the Free Syrian Army rebel group, Gen. Salim Idris, told a news conference in Turkey that the Russian initiative would "buy time" and that rebels will continue "fighting the regime and work for bringing it down." He said that if international inspectors come to Syria in order to inspect chemical weapons, "we will facilitate their passages but there will be no cease-fire." The FSA will not block the work of U.N. inspectors, he said, and the "inspectors will not be subjected to rebel fire when they are in regime-controlled areas." Idris said Kerry told him by telephone that "the alternative of military strikes is still on the table."